Data and feedback help product designers improve their customer’s’ experience. The same goes for how you can shape your experience for guests staying in your home. One helpful exercise is to observe how your guest interacts with your listing for the first time. Where do they look? What links do they click? What do they notice? What questions do they have? We’ve used these discovery principles to think carefully about how the guest experience can be as easy as apple pie. Next time you prepare to host guests, use this reminder — here are the 5 things that hosts commonly forget about. Guests love getting a personalized perspective on their destination. After all, they’re choosing to stay in your home over a generic, standardized hotel room. Help them discover the unique personality of your vacation rental as soon as they enter. This can include unique art or objects that show off your neighborhood or family’s character, or even food that is special to your area. For example, one Hostfully host we chatted with loves hummingbirds. He leaves hummingbird art and objects all around his home. It’s an easy way to share a bit about yourself and also be even more welcoming to guests. If you’re comfortable sharing a photograph of you and/or your family, displaying that can be a nice touch, too. People’s attention span is dwindling. Unfortunately, this means that it will be even harder for you to share the important things that your guests need to know when they stay in your home. However, we discovered that many hosts fail to include the most essential information at the beginning of their guidebook. This free online tool will allow you to share basic information for your listing including check-in, directions to your listing, your contact information, and wi-fi instructions. Make sure that the first page of your guidebook includes all the important things your guests need to know — period. If it isn’t essential, don’t put it on the first page . You can include it later for those of your guests who are patient and like to read. Guests will also need to know the location of the nearest grocery store, pharmacy, and of course, the closest coffee shop. Make sure you include safety precautions if that is relevant for your listing. Keep this information short and sweet. Most people don’t like to go to crowded places with overpriced prices when visiting a new place. This is where you, as a host, play a key role. Showing your city with the eyes of a local is an experience guests look forward to. Andrew Ostrowski, an avid host in Nashville, has opened his house to dozens of guests across the country. His favorite part? Helping guests live like a local and sharing with them the hidden gems that made him fall for his historic city. There’s nothing worse than a communication breakdown in the first 24 hours of your guests’ stay. We’ve seen hosts who rent out 2 different areas of their home — and when one group couldn’t contact him, they got confused entered the other guests’ bedroom at midnight! While it made for a great laugh around the kitchen table the next day, you want to ensure that your guests can reach you and ask important questions , especially within the first 24 hours. Make sure your phone and email are turned on and encourage your guests to text you with questions (because it’s typically the most reliable and fastest way to communicate). About 50% of tourists do detailed planning about their trip before they arrive, but most hosts don’t do as much as they can to share their own local recommendations. 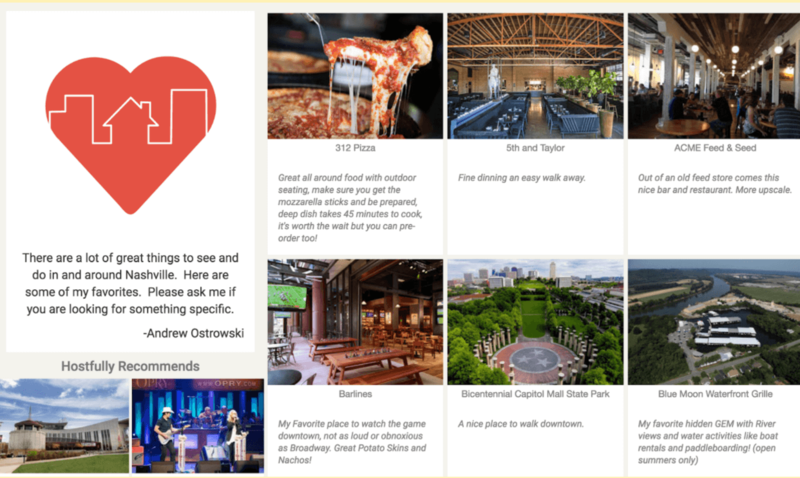 Help your guests discover what you love about your neighborhood by sharing your guidebook before they get there. That way, they can come with better questions and make more informed decisions about what they want to do during their stay. Make sure your guidebook includes recommendations . Feel free to sprinkle in a few stories about you and your family enjoying your favorite local spots . This makes it more personal. What tips can you share that will help other Airbnb hosts create better experiences for their guests? Make sure you don’t make the 5 biggest Airbnb hosting mistakes. Listening to your guests’ feedback and observing how they interact with you are key to provide the most out of every stay. This article is courtesy by Hostfully—a platform for people to provide better hospitality to their guests. They couple local, personalized recommendations with essential listing information to make a complete guidebook for each listing. Hostfully currently operates all around the world.